New monthly class begins April 20th, and then every 3rd Saturday of the month. 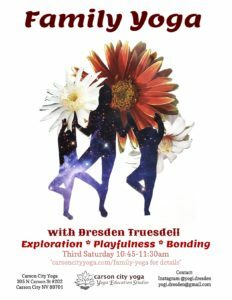 In this class, families with children (ages 4-12) are invited to come and explore various aspects of yogic practice together. There will be a variety of poses, songs and activities based around a monthly theme reflecting on a core element of yoga practice. Children will love learning fun partner poses with siblings and/or parents, simple breath techniques, and epic stories that give some poses their names. 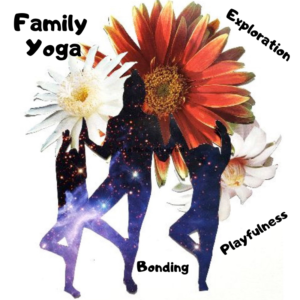 This class will be a fun, not-so-serious look at yoga where families can bond and work together. Join us on the 3rd Saturday of the Month, 10:45 – 11:30am for family fun! Pay What You Can, donations appreciated. A suggested donation of $10-$15 per family helps us keep the studio running and pays the teacher, but please know that no one will be turned away if money happens to be tight. Come as a family, no obligation, and enjoy some time together. This is for YOU!